GPUs just arrived straight from U. This rig is plug and play. And can mine 70+ different coins. We also offer full-time support: we're committed to getting and keeping you up and running. Aeon (AEON), Akroma (AKA), Alqo (ALQO), Arqma (ARQ), Arto (RTO), Bismuth (BIS), Bitcoin Interest (BCI), Bitcoin Private (BTCP), BitSum (BSM), Bytecoin (BCN), Callisto (CLO), Decred (DCR), Dero (DERO), Digibyte (DGB), DubaiCoin (DBIX), Electroneum (ETN), Electronic Dollar "eDollar" (EDL), Ellaism (ELLA), Elya (ELYA), Ethereum (ETH), Ethereum Classic (ETC), Expanse (EXP), Feathercoin (FTC), Graft (GRFT), Hanacoin (HANA), Haven (XHV), Hush (HUSH), Intense Coin (ITNS), Karbowanec (KRB), Komodo (KMD), Library Credits (LBC), Loki (LOKI), Masari (MSR), Metaverse (ETP), MonaCoin (MONA), Monero (XMR), MoneroV (XMV), Musicoin (MUS), Nekonium (NUKO), Pascalcoin (PASC), Pegascoin (PGC), Pennykoin (PK), Pigeoncoin (PGN), Pirl (PIRL), PrivatePay (XPP), Quantum Resistant Ledger (QRL), Ravencoin (RVN), Ryo (RYO), Saronite (XRN), Siacoin (SIA), SolaceCoin (SOLACE), Stellite (XTL), Sumokoin (SUMO), Triton (TRIT), Ubiq (UBQ), Ultranote (XUN), Vertcoin (VTC), Votecoin (VOT), Zcash (ZEC), Zclassic (ZCL), Zcoin (XZC), ZenCash (ZEN). Our rigs also support dual mining (two coins at once)! Stackable, anodized aluminum open-air frame. 2 power supplies (1700 watts total), gold certified, supports 110-240 Volts. ASUS Prime Z270-A motherboard with 1 M.
8 MSI Armor RX 570 8GB GPUs: U. Sourced, bios modified and overcolocked/undervolted to reliably and consistently provide maximum performance. Wattage: 1200 + 100 single-coin mining, depending on the coin. About 40 dB-A without an external fan (noise level in a typical library). 24-1/2" x 10-1/4" x 13-3/4 (length x width x height) 54.5 cm x 26 cm x 35 cm. Authentic Windows 10 64-bit Professional License. MSI Afterburner for adjusting overclock settings to your current mining preference (pre-loaded profiles set to optimize mining with Ethereum, Monero, & Zcash). Mining software for mining 70+ coins in single-coin or dual coin mining modes. One-stop repository to deposit all your wallet addresses. We test each of our machines for 48 hours before sending! We provide service and support! We can help you decide what coins to mine. Trying to decide between ours and other rigs? 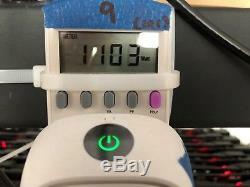 Custom, high-performance bios mods developed by Stanford PhD in computer science = high hashrate without compromised uptime or wattage (link to perf videos). Our GPUs are brand new, they are not mining-specific, and they are RX 580 8GB (as opposed to 570 or 4GB). This means a much higher resale value than any alternative set up. We test each rig on several coins for a few days. We are also able to swap out any parts that go bad within 90 days. We set up the coins, and pools all as shortcuts in startup. We have a Stanford MBA on staff who serves as a thought partner on what coins to mine. Our software can mine more coins than anything else out there. We offer service plans, which our customers who travel a lot or have many rigs have requested to maximize your rigs uptime, and we push any critical software updates as needed. We also undervolt and fine-tune bios parameters to make sure this happens. Check us out on LinkedIn. We are real people, with a large facility in Colorado Springs, which you can come and visit. Wonder what else you need? Looking to build a large farm? Weve been around for a year and a half and are not going anywhere. I put my utmost trust in them, love the service. Rig arrived earlier than expected in excellent shape. I was mining in no time. Great communication Plug and Play Perfect. Item received quickly as described. Pluged in and ran out of box! Great guys to deal with! A+++ Started mining right out of box, Customer service is A+++. Bit 49 was formed by two Stanford graduate students -- one in business, one in computer science. Our mission is to make the most high performing, reliable, and user-friendly mining solutions possible. And we are here to stay! The rigs are great and Fil was extremely helpful in troubleshooting. 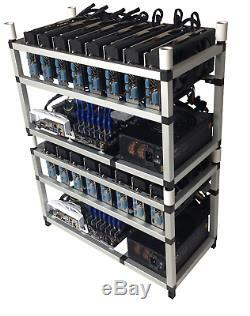 These Mining Rigs are the BEST you will find anywhereGREAT ValueThank you. Honest and easy to work with. These guys are legit if you want a no maintenance mining rig. I plugged it in & was mining ETH. Very personable and item is as described. Item arrived packed well and went to work on the rig stack right out of box. Beautiful build, high performance and high-touch customer service first rate! Professionally configured hardware & software. This is the gold standard of rigs. What equipment is needed to run my rig? Monitor with HDMI output cable (or an adapter that goes to HDMI out). Can your rig mine Bitcoin? Bitcoin is ASIC mineable, meaning specialized hardware is optimized to mine it. Our machines are optimized to mine altcoins, such as Ethereum, Monero and 70+ other altcoins. How much can I earn with your rig? They have mining calculators where you can plug in the hash rate (226 MH/s), power consumption (1200 W), and your local electricity rate for a good estimate on electricity cost and earnings on a daily, weekly, monthly, and yearly basis. Profitability is hard to measure because there are so many factors involved ie. Price volatility, network hashrate, so-called "difficulty, " electricity cost. We shouldn't expect crypto to behave like bonds with a steady cash flow. Rather, the high variability is such that it's best valued like a derivative (think: call option). On one hand, if you had mined Ethereum all last year, you might have averaged about that much a month Note: you would have been mining several eth in a week--that number keeps shrinking as hashrate increases on the network to where today much less than 1 eth can be earned a month. For current details, check cryptocopmare. That said, if you had just kept half of your earnings, you'd be sitting on a tens of thousands. I think many miners at least hold for a while, trying to time exit at favorable periods, in which case the future value of your earnings would hopefully appreciate beyond this month's prices. The last thing to keep in mind is the resale value. If crypto tanks, GPUs will at least retain some value. On the other hand if the market just hums along, the question is not can your mining earnings exceed what you paid, but can mined earnings + resale value exceed it. On that view, you may be in better shape 1-3 years from now than you think (when it might be a good idea to upgrade at any rate). If so, is there a discount? We consider bulk orders and discounts on a per order basis. When I receive my rig, will I receive technical help? If you are in need of technical assistance, please let us know, and a member of our tech team will respond same-day. What kind of support do you provide? Your rig will be pre-configured with your wallet addresses, and optimized to mine your mining coin preference upon startup. We also provide a user manual that comes with you rig. If you have any technical difficulties, we will provide you support to get your rig up and running. Can I install my own software? We recommend only mining with the software we provide. We cannot guarantee good support if you install your own software on your machine. How long can I expect the mining rig to last if I run it constantly? Properly taken care of, such rigs are said to last 5-10 years. Think of this question similar to the question, How long will your car last? Well, it depends on a lot of factors. What make & model (cheapest car you could find, or high end)? What is the quality of parts used low quality parts that could be mass produced overseas as inexpensively as possible, or new, brand-name and U. How is the car maintained (preventative, routine maintenance or wait until something breaks and then fix it)? We have custom engineered our rigs from the ground up. We use the best quality, brand new parts. We manually optimize each rig to maximize productivity while maintaining stability and minimizing excess wear-and-tear on your components. Can I use Wifi for my rig? Several of our customers use WiFi without any issues. So at the end of the day, due to all of the uncertainty and variables that WiFi brings, we recommend everyone not use it, and plug their mining rigs in with ethernet cables instead. Most home WiFi routers have a few ethernet ports in the back already, so this is typically the easiest way to go. The item "8x GPU RX 570 8GB CLOSED CASE Mining Rig 240 MH/s Ethereum + 70 altcoins" is in sale since Wednesday, August 15, 2018. This item is in the category "Coins & Paper Money\Virtual Currency\Miners". 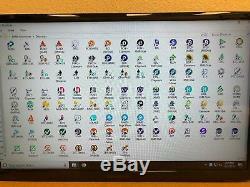 The seller is "bit_49_llc" and is located in Colorado Springs, Colorado. This item can be shipped worldwide.